PS-6 Harmonist, Octaver/Harmonizer/Whammy from Boss. 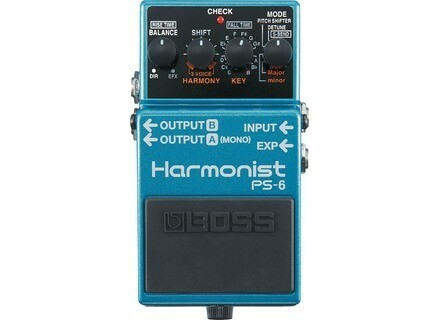 tonmazz's review"Boss PS-6 Harmonist - Does its job"
The Boss PS-6 can produce muti guitar sounds to emulate two or even three guitars playing at once. It has jacks for stereo use and even a jack to utilze an expression pedal with this unit. You can set your harmonies for major or minor keys and with the Key knob pick your exact key. The pitch shifter and detune option is also available for selection with the mode button. It also comes with a very detailed owners manual. The utilization of this unit and how easy it is depends on what your use will be. I have found the Harmonist features to be a bit difficult to master. I also feel that this is maybe too much functionality for a stomp box. It gets hard to keep track of the different modes within this small unit as the knobs do different things depending on which mode you are in. The manual is detailed but this still seems a bit complex for a stomp box. The sound quality is ok but I have played better Harmonists and better units that emulate Harmony a bit better than this unit. That being said, there may be those that can dial this in better than I can which speaks to the ease of use I referenced above. I think something like the GT-10 is much better for simulating multi-guitar scenarios that sound realistic and is easier to figure out. The one shining feature of this unit is the detune setting which basically simulates a whammy bar. I play a Les Paul and play in a cover band so every now and then need to do a dive bomb and for that, this is perfect! I suppose if you are looking for a basic Harmonist that can do the job, this is sufficient but I have played and gigged with better units for simulating multiple guitars, the GT-10 for one. If you want to simulate a dive bomb on a fixed bridge guitar, go and get one today and you won't be sorry. The other thing that is tough with this unit is that when transporting, it is so easy to twist up the knobs and figuring out where your settings were can be a pain. As I said the complexity built into this little unit makes for a lot of choices on the 4 knobs which is a minus in the ease of use category. All in all does the job but there are better options for Harmonists. The Boss PS-6 Harmonist is a very simple, but highly effective octave pedal. The pedal has a pretty standard make up in terms of it's general characteristics, consisting of 1/4" connections for your input and output, and requiring power from a nine volt battery or power supply. The pedal has true bypass, so you won't get any signal loss when the pedal is disengaged. The PS-6 Harmonist isn't rackable as it's a stomp box. The make up of the PS-6 Harmonist really couldn't be any simpler. The three parameters that the pedal has are for controlling the direct level, octave up level, and octave down level. You can blend the three of these any which way you like, which can give you a variety of results. I've never seen the manual for PS-6 Harmonist , nor do I think I ever will. The overall sound of the PS-6 Harmonist makes it one of the cleanest sounding octave pedals that I've used to date. Most of this has to do with the tracking, as it's got awesome tracking that doesn't break up unless you try to play too many notes at once. I like both the octave down and octave up sounds equally, but I do think that the tracking is slightly better on the octave down. It's great that you can also blend the two of them, with or without the original signal in there. 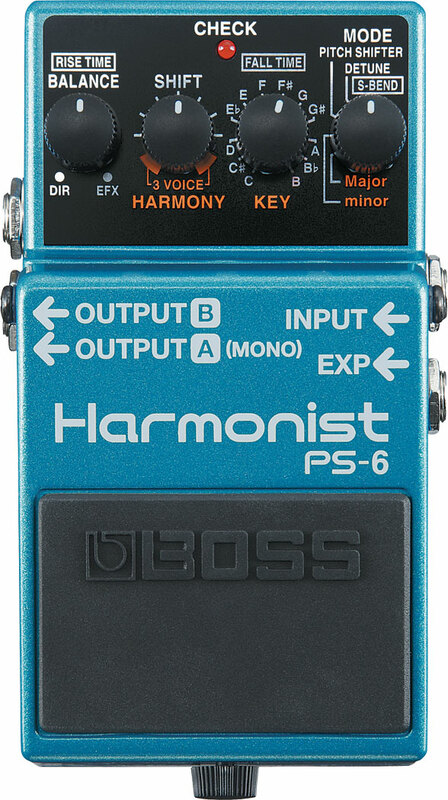 Boss recently released the PS-6 Harmonist Pitch Shifter. This unit picks up where the PS-4 and PS-5 have left off. I was in my local guitar shop and thought I'd check this out. I always loved the guitar work of Boston and Queen and thought this would get me into the ballpark. New the pedal is $139. So many options in this tiny pedal. You can go down 3 octaves or up 4, add that in with your current instruments range and you are covering a whole lot of ground! Other options are harmony based on keys. Enter in whatever key you are in with the option of major or minor and choose the interval you'd like harmonized. There is a blend knob to adjust how much effected and dry signal you want. Saved presets would be an amazing feature to be added, but in reality are you going to use harmony guitar on EVERY song? The standard, you gotta be doing something absolutely crazy to break this construction that has been offered by Boss for years. Add a new dimension and range to your instrument. Easy to use out of the box and the tracking is exceptional. titivedder's review (This content has been automatically translated from French)" Multifunction pedal, I love it!" Use not necessarily obvious at first, except for the S-bend, you tame! The pitch sounds and harmony sound a bit artificial, but it looks good! I use it for over a year now, I'm glad I did not change. I would have tried the expression pedal with the most precision. nowhereman's review (This content has been automatically translated from French)" POG and Whammy in a more +"
it's been a while seriously eyeing to whammy, POG and other pitcheuse whatnot. the whammy had the advantage of offering fairly extreme effects, but ..... not mix effect?! POG, he had the advantage of offering near the organ effects, ideal for arpeggios but ..... no expression pedal?! And then, oh joy, it includes the effect of the two pedals mentioned previously with functions +!! 1 input, 2 outputs (stereo) and an outlet for expression pedal! if you are looking for sounds to RATM, the kills, white stripes, Brian May, black keys, or Gilmour solo déguelasses (like 80's metal solo) and many other things that you will pedal! I use it since yesterday and after some hesitation due to price and a test group, I am totally hooked! 90 euros, I resigns now! V old man on the hill's review (This content has been automatically translated from French)" Blue Whammy"
The Boss Harmonist PS 6 is the latest version of the series pitch shifter. Boss digital energizable with a classic transformer 9v DC with one input and two outputs and a stereo plug in for optional expression pedal. The first three potentiometers can be found differament assigned according to the selected mode. Each mode is a church and for my part I regret the fact that Boss is not integrated magnets or stickers to put on the facade of its multifunction pedals. The manual is very simple accentuates this regret. I do not singerais it by lending me the game descriptions. Just to say that the four effects are convincing in their respective styles. But we must choose a mode s and hold it there for a pedalboard and integration of a concert set list I do not see how we can turn those little knobs on the acting harmony in the dark. For my part I derive the maximum of this pedal is an oscillation between S mode and detune bend me therefore allows easy switch between Whammy 2 octaves and a very considerable light Chorus. Quality Boss is waiting for you. Because when it comes to hack digital brand knows his business unlike analog which leaves me cold. Adrian Smith and Dave Muray your amp is up to you! Be aware that the credibility of harmonies straight does not replace a real pair of guitarists. But it can play permetre Bridge Master of puppets fairly unlike the founding fathers of thrash. If the sound of Steve Vai's 90 is still valid for you here is a pedal connection with your tastes. It outputs a shifted sound of one or two octaves up or down. Finally, a pitch shifter anything! A very light and transparant chorus can not satisfy people in search of a more pronounced effect. S-BEND is the reason for my purchase because I'm at war with Digitech since arrived after two Whammy I (sold to upgrade two Whammy IV, do not laugh, please!) And still the same problems I have seized the opportunity to switch to the pedal and the surprise was pleasant. First, contrary to what the manual says any expression pedal (stereo jack) can do taf, you find the glass slipper. But the surprise is the utiisée as such, the pressure on the PS6 only generates whammy effect controlled by the first and third knobs become a Rise and Fall Time. Awesome! One of the major deficiencies of the concurrency red fire is what bypass ultra colorful digital and not found on the Harmonist, which cut when her some momentum. This is why I have also turned the pedal, my very old Roland EV5 all seemed slow and only responds to PS6 day today my expectations. But I testerais well BOSS FV 500! Finally I knew the existence of The Ring Thing but the visual does not inspire me more than that. And then the Whammy is one of the coolest effects in the world is not so ca Electro Harmonix and BOSS pedals manufactured more reliable and powerful. grozeil's review (This content has been automatically translated from French)" She's under the hood ..."
The other 3 knobs have their respective functions change depending on the selected mode. Should there be a shortage, it would be a stereo input. I shall have a well-bonded delay effect on the notes harmonized (I think it already exists on an old Boss model, the PS-3 I think). The configuration is simple, but it's enough to spend a few hours to explore all possibilities of the pedal. If I have tested up and down, I focused on two or three sounds. The settings are three in number, it is easy to change between these two titles. The manual is very clear and well done, and I urge everyone to read it before you buy this machine, as it provides information on some well-related functions, such as using the expression pedal. - A pitch-shifter effect to the fourth or fifth, or possibly an octave. Unlike the harmonizer mode, the effect of pitch is polyphonic, so you can play chords. This mode allows a game a little "dirty", while the harmonizer mode, monophonic, must be approached with a set of otherwise clean stalls not necessarily very musical. In this mode, I set the effect level low enough to magnify the sound while maintaining a natural grain. If the level of the effect is mounted beyond 11am-12pm, I think we lost a little natural (except maybe if we play with the simple octave) and means that it is a digital effect. In both cases, I do not use the expression pedal: for the whammy effect, you can set the time to rise and fall, and I find it rather well. Set very long, you can have sounds really crazy. For the purpose Pitchshifter, I'm not interested really control the height of harmonization with the expression pedal. That said, to have a connected, it works really well. Another thing: the bypass is really very good. Clearly, in the direct competitor, the Whammy, the bypass is poor. With the PS-6, it is not, and I tend to believe that the bypass of the latest pedals Boss has been improved over older models. As I said above, I have no way of comparison with other pedals of this type. I guess the Pitchfactor Eventide sounds better and makes it a lot more, but its price and size are prohibitive for me using this with such parsimony. Personally, I utiise to bring a truly amazing effect on my game, I do not care whether it sounds natural or not. Try before you buy, but I personally do not regret my choice! Echo tango's review (This content has been automatically translated from French)" Powerful tool!" See section on the information sheet. In summary we have a detune / pitch shifter / harmonizer extensive opportunities, all controllable via an expression pedal. The manual saves some time, especially for master mode "harmonizer". To edit the sounds you turn the knobs and that's it. It remains to see how it gérertout live.Avec in a little practice you should be fine. placed after a distortion pedal / overdrive (I use the personal Dist-X or the Blackstar HT-Dual) this pedal sounds of hell mode harmonizer. Mode "detune" is the most beautiful effect in the clear. S Bend is a bit more difficult to control. An expression pedal seems a great help if we want to exploit the bug fond.Correctement doses, the effects are very musical. As for the next "articial" harmonies produced one likes it or not. I went through a few forums that talked about problems of tracking: for my part I have not noticed the noticeable at this level. .Gwe's review (This content has been automatically translated from French)"A pedal that&#39;s worth!" This pedal has a harmonizer of 2 and even 3 votes after the tone being asked, a high quality pitch shifter, detune effect and super bend (do not go through 4 way: a whammy effect). There are also Octavers. The Whammy effect comes in several patterns of climbs / descents, with interesting variations. It is best to go see the instructions on the site and Boss tests on Youtube. This is an effect pedal Boss digital format, without expression pedal like the Digitech Whammy. The competition has however taken midday, we did not at Boss. SP-6 has a guitar input and expression pedal (youhou!) and two outputs (1 output mono or stereo while). The stereo can send the one hand the direct sound and the other the effect, or alternatively, different effect on each side (I&#39;ll let you read the manual that will answer your questions!). As the controls are long and thin and they are many things to see, it is not always what you do, it is home to pay by the stage! The manual is very clear, and without him the edition must be difficult (at least that&#39;s a big waste of time!). In any case the small pedal with 4 pots offers a number of effects and parameters impressive! Once we know it a bit it quickly becomes very intuitive. The lack of expression pedal is obviously a disadvantage ... But see the good side of things personally, it&#39;s been a month since I (intensive use cons!) And it did not even horribly failed because the speed of ascent and descent Whammy effects can be controlled. Another bright side: For those who do not need is the place won on the pedalboard! Food Question: it is a bit bulimic batteries, but it is not difficult at the feeding transformer (9V power supply with no noise Zoom, Korg, Electro Harmonix, and Dunlop DC Brick). Harmony: choose a major or minor, the tonality, then the distribution of votes, the balance between direct and effect. No major problem, but minor, the pedal will not choose for you when you want to put your sensitive or not, not to choose either between melodic minor (ascending / descending) and harmonic ... at the same time the problem is easily bypassed. The inversions are given interesting, I think there is just enough, then he must tweak a bit. Small problem: there is a small latency. Another plus: the octave has a good sound quality. The interest is primarily to split a popping sound: put on a clear harmony does not flatter her at all, and as we know, our distos OD and drool over our third as large slugs, accepting only the fifths and octaves. By putting the PS-6 after the saturation, it seems that there are several guitars, as it is not natural to hear such beautiful thirds, sixths and sevenths other with a sound so smooth! Pitch Shifter: The settings are the same as Harmony, except that the Knob tone selection is inactive. I never use this because it was not what I want. He consistently plays a range of tone / half tone above the note without following tone is a classic effect. It is here in good quality and latency does not sound like Harmony. The functions are Octavers advantage of the polyphony, unlike the Harmony mode where everything is monaural. So not really audible latency, "polyphony" ... Attention is not very clean, the stamp is a bit trashed in polyphony. Detune: detune I use a clean sound or a slight overdrive (I use the BD-2) is wonderful! The effect is to double what you play the same thing slightly above or slightly below, as if you were given a fraction of discordant tone. We choose the fraction of a tone above and / or above, the balance and then ... Enjoy! After I get my distortion sounds to give some interesting synth pads with my guitar. Super Bend is why I bought this gem at the base. So the famous Whammy effect, we hear from Rage Against the Machine and especially for Muse! I was interested also to a tone bender or more sounds Clavinet example (oh yes another icon that uses the Whammy: Hervé Salters). It is possible to adjust the bend on a number given octave, tone, an octave above, below a (mono or right and left!) And modulations funny. I use a Yamaha guitar (not even ashamed!) And I warm up with all the lights of my Fender Hot Rod. I would glue before OD and distortion, and my clone Fuzz Factory afterwards. Why then? Because the fuzz has a dirty sound that does not fit well with the harmony and function is more appropriate to detune sounds a little neat ... However much the Super Bend distorts the sound, but before the fuzz is great! I use it extensively for a month. I have unfortunately never tested the competition, but obviously beats the Boss Digitech quality level and price level. When I see the next Whammy promises $ 450 I think that it does not worth at all to miss the Boss! I have not tried either the Electro Harmonix Ring Thing that looks fine too. Instead of buying a Whammy, you can buy an EHX and Boss for less! I like the originality and quality sound effects and Detune Harmony. At the beginning I did not like the harmony because it is clear in his ugly, you really learn to use it wisely, I think she is great! I sought a Whammy effect and I&#39;m not disappointed, great! I bought it at 100 € Used, well then the price / quality ratio is unbeatable! The scope of the expression pedal is a little absent across, but it is preventable and it&#39;s not dramatic! 9 out of 10 because nobody is perfect! (An expression pedal is expensive and sound quality level, even if it is at the forefront of what is done today, it takes to evolve!) Is somewhat a matter of principle as not to 10/10, but I think there is no better choice! To add to his pedalboard without hesitation! philou27's review (This content has been automatically translated from French)" Fun"
For a nice sound, you need a tube amp because at the beginning I used a combo transistor. Then if multiple pedals, have a good chaining is crucial, particularly if used with distortion, it must be placed after the distortion pedal, When all this is fulfilled, this pedal is great. I use it in concert last semaine.J love it sonore.couplé rendering with the new Boss ST2, or on clear, with a short delay ...! for me it is perfect.